It seems whenever I get intimidated by a particular project on my '37 Buick, I am far too willing to push it to the back burner. My glass sat uninstalled for months . . . as did my transmission . . . you get the idea. It also seems that when I finally get around to doing the intimidating project, I finish it up and think "That wasn't so bad after all." The latest project I've been avoiding was the installation of my rear suspension, rear end and fuel tank. 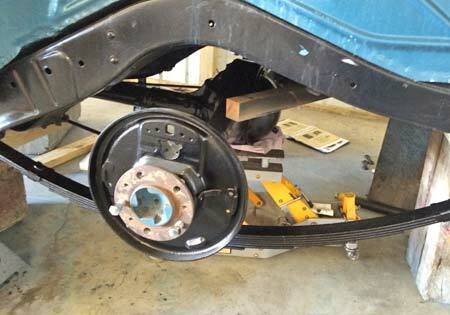 I'd need to get all of this installed if I wanted to get my car back on its wheels, so I started with my leaf springs. 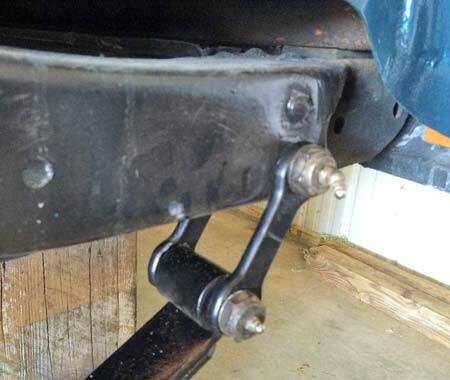 After making the decision to replace my leaf springs in a few years, I've decided to forego the tin gaiters that were originally found on '37 Buicks. However, I would still need a set of rebound clips and a center bolt to keep the springs packed together and straight. I asked around for recommendations and was told to head to downtown Harrisburg to "the best spring shop in central Pennsylvania." To say that the spring shop was a bit gritty would be putting it mildly. Upon entering I was greeted . . . er, grunted at, by a man in full biker gear complete with vest, torn t-shirt and a full sleeve of old school tattoos seemingly applied with a pocket knife and pen ink. To top his look off, the greeter only had one eye. I immediately realized I wasn't going to get the same customer service as I would expect at a furniture store so I explained what I wanted and was told to sit down and wait. 45-minutes later I generated enough courage to go back to the counter to ask about my parts when another biker swooped in, figured out what I needed, and had me out the door in 3-minutes and only $5 lighter. Center pin installed on my leaf springs. After they were fully assembled I cut off the excess length. 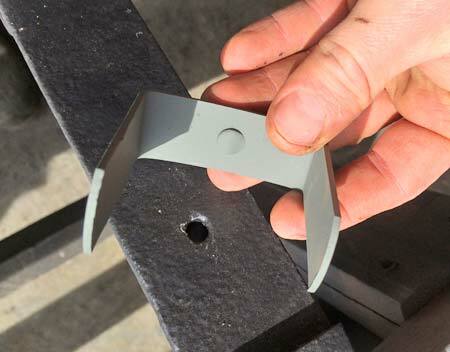 After compressing the leaf springs and inserting the center pin I proceeded to install the rebound clips. 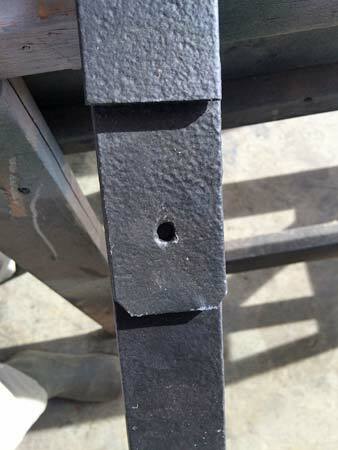 These are simply U-shaped steel brackets that are bent around the springs. A small dimple protruding from the clips gets paired with a hole in the spring, preventing it from sliding fore and aft. Yes, I know my springs are pitted, but what this picture is really trying to show is the indent where the rebound clip dimple rests. Hammering the sides over on the clips is straightforward and requires little explanation but I will tell you to NOT hold onto the pack of springs while you hammer away because the pounding action will cause the springs to separate ever so slightly and they will then grab your skin and leave some painful blood blisters when they rebound. If you are smart, you will either not hold the springs or you will learn after one pinch. If you are a bit less than smart you will earn three blood blisters like me. I had originally planned on installing my fuel tank before installing the rear suspension but, with the fully assembled leaf springs in hand, I decided to switch things up. The rear leaf springs are connected to the car frame with a set of fore and aft shackles and bolts. The shackles allow for some movement during driving conditions making for a smooth ride. 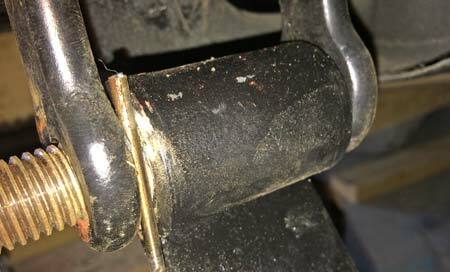 The shackle on the outer side of the frame has a standard thread but the inner shackle features tapered threads. Once driven in all the way, the tapered thread and a heavy duty lock washer make it virtually impossible for the shackle bolt to work its way out on its own. 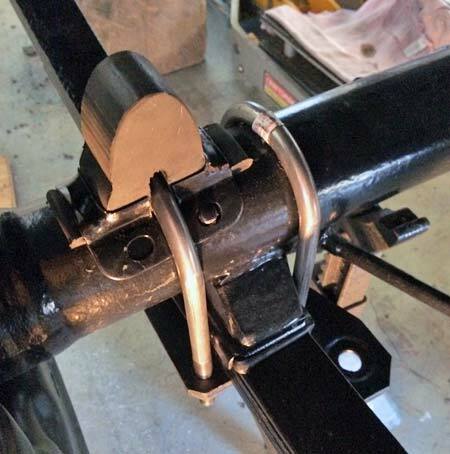 Mounting the leaf spring between the shackles. 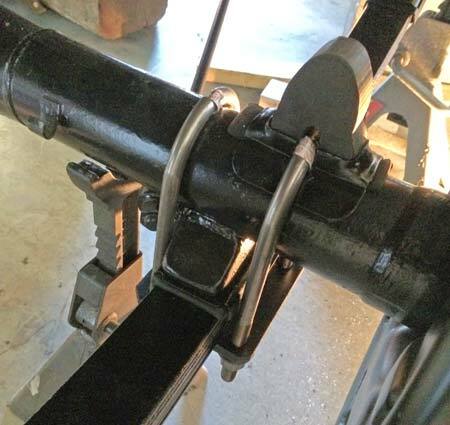 A little care must be employed when making this shackle sandwich as the Shop Manual calls for a 1/8" gap (+/- 1/32") in between shackles and spring bushings. This gap will allow for free movement during driving. To ensure this gap was correct I simply used a 1/8" drill bit as a spacer when installing the bolt. Before too long both sides of my car had their leaf springs back on. The Shop Manual called for 1/8" of space between the shackles and springs. I used a 1/8" drill bit as a spacer. From here I had to install the rear end U-bolts, spring-to-axle pad and underside bracket that would allow me to attach my rear shock links. 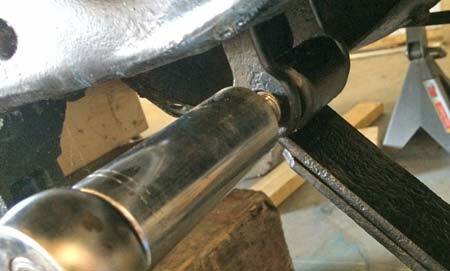 With my rear end on my motorcycle jack I put it in to a position where I could start the nuts on my U-bolts, then I just tightened the nuts in an alternating fashion until I hit my torque specs. Feeling quite satisfied, I placed jack stands under the rear axle and let the car rest on that rear axle for the first time in 2-1/2 years! The last part to work on before I can say that the rear suspension is complete is to install my overhauled rear shocks, new shock links and rear stabilizer. One leaf spring, fully installed. Rear end of the driver's leaf spring. Looking forward on the passenger side after the U-bolts and axle bumper were installed. Looking rearward on the passenger side — note how the locating nub on the axle ensures accurate placement of the axle bumper. As I mentioned before, I had originally planned on installing my car's fuel tank before installing the rear end. With no rear springs to deal with I would have had plenty of room to move and rotate the tank. Without extra room it is possible to do the job but you have to work a whole lot harder. The tank is held into the frame with steel straps. 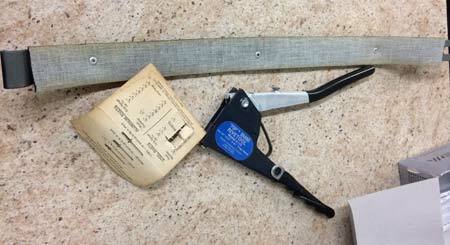 These straps run on the left and right side of the tank and are insulated with rubber that is approximately 1/8" thick. 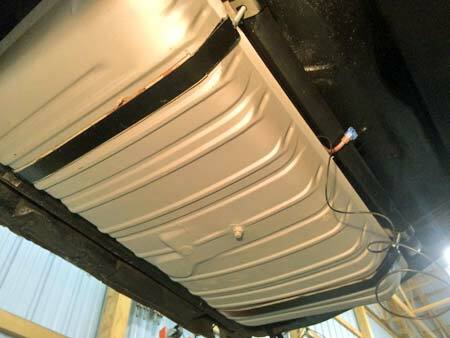 This insulation keeps the tank in place and prevents and squeaking during driving. The straps slide into the rear part of the frame and extend forward, where a T-bolt is placed in the lower strap, goes through the upper strap and through the frame where a nut secures the entire assembly. I used pop rivets to secure my gas tank strap insulators. The gas tank is back into position. The black wire is the auxiliary "ground" that I made for the sending unit. The hardest part about this tank install is the fact that part of the filler neck is permanently attached to the tank itself. 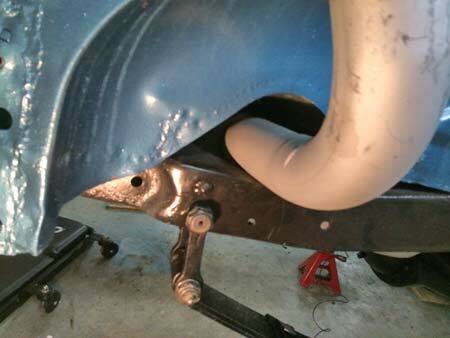 This filler neck has to pass through a small hole above the frame and below the body. If you torque too much on the neck it will cause a leak right at the neck/tank juncture. With the leaf springs installed it is almost impossible to snake the neck through the frame hole and twist it in to position. You can snake and twist it in to position but you'll have to jack the car up so nearly 30" of clearance exists between the frame and the floor. The passageway between the frame and body is pretty small. Even with my hiccup, the tank install only took about 35 minutes. When I went back inside after completing the wrestling match my wife said "Oh, that was quick." Yeah honey, I'm a pro.